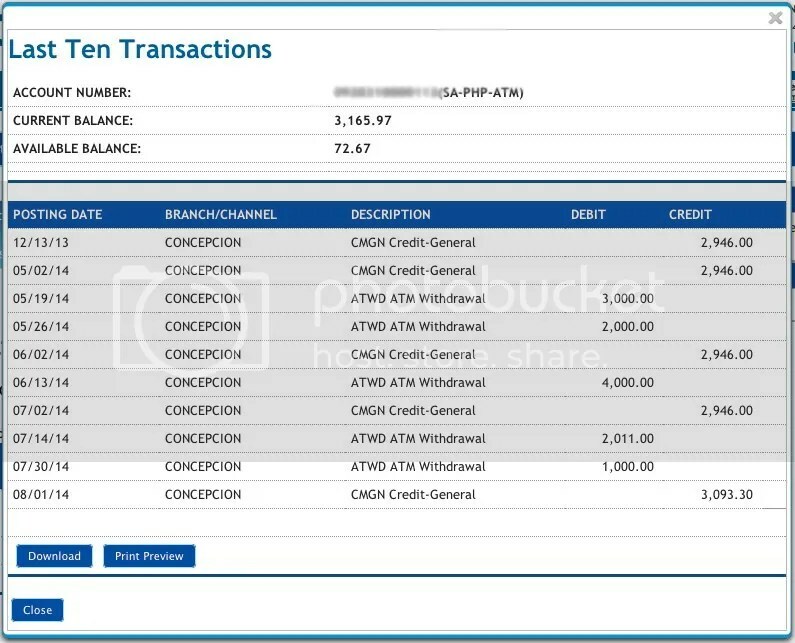 The second image on this blog is a screenshot of the last ten transactions on my exclusive bank account where the Social Security System (SSS) remits my monthly retirement pension. You may click the image to see a more readable version. I had already posted an earlier blog about my bank’s practice of holding on to my small SSS monthly pension for at least ten (10) days before they make it available for my withdrawal. My purpose in having this second post about my floating SSS pension is to prove if my previous observation was correct and possibly call the attention of concerned SSS officers that the practice is prevailing and unfair to pensioners. Take note that the amount of PH₱3,093.30 was credited to my account yesterday (August 01, 2014) and, per previous experience, it will remain floating (credited but cannot be withdrawn) for at least 10 days more. I will post an update here once I had it available which is usually on the same day I will withdraw an amount from my account. I hope that my bank will make it available for withdrawal in at most 2 to 3 banking days (“bank float” in their parlance) though I have already said in my previous post on the subject that it should be immediately withdrawable because the banks are collecting agents of SSS contributions so the monies for the payments of our pensions are already in their hands. By the way, did you notice in attached bank statement that my SSS monthly pension increased from PH₱2,946.00 to PH₱3,093.30 for a total of PH₱147.30 to be exact. I cannot think of any reason for such increase except that SSS has finally granted me an adjustment for my 1985 to 1989 contributions which I requested one year and two months ago (please see An Unfinished Business With SSS). To my readers who are recent SSS pensioners (I know there are not many so I also call on their children and grandchildren) . . . Do you know that if you were active members in 1985 to 1989, your contributions on this years were not included in the computation of your monthly pension and that you have to file a request for adjustment in order to get the adjustment? If my assumption that the PH₱147.30 increase in the amount credited to my bank account is the adjustment to my monthly SSS pension due to my 1985 to 1989 contributions, then I would like to ask SSS if I am entitled to differential backpay for the twenty-one (21) months before August 2014 when I got only my unadjusted monthly pension. Consider this, if I am entitled to get a backpay, it is only PH₱3,093.30 that’s due to me but if you will consider the possibility that there hundreds of thousands of similarly situated SSS pensioners, then we are not talking of peanuts here. I hope SSS would enlighten us on this issue. UPDATE 1 (08-02-2014 7:25pm) – A reader-friend sent me a note to tell me that the PH₱147.30 increase in my August pension is exactly 5% of my original PH₱2,946.00 monthly pension so the amount represents the recently announced 5% increase in the pension of all SSS retirees. This means that I still have my unfinished business with SSS with regards to the adjustment I requested for my 1985 to 1989 contributions. UPDATE 2 (08-30-2014) – I monitored my account daily since making this post using online banking and found that my August SSS pension became available or withdrawable on August 08, 2014. So, it took 7 days for my bank to release my money this time. A little improvement from the 12 to 14 days in months prior to August 2014. You may have finally gotten the adjustment you asked for. Your readers who are also in the dark about their contributions would love to read this post. Not so. As I inform in my first update, the increase in the amount credited to my account for the mont of August could be the 5% across-the-board increase granted by SSS to its pensioners recently. This is very helpful for me because I’m the one in charge of withdrawing my father’s SSS pension. Good to know that you are the one managing your father’s SSS pension. Maybe, you could help me establish if the more than usual float by my bank is also being done by your father’s bank. Thank you in advance. Oh, I didn’t know about floating SSS pension! That’s so weird! If they already credited it, why not make it instantly available for withdrawal like any other accounts? Anyway, thank you for sharing about this sir Ed! I may be far from being a pensioner, but knowing this now is really helpful. I think some time in the future, I’ll be the one managing my parents’ SSS pension. >.< Oh, and I hope SSS will already act upon it and grant you your adjustment for 1985-1989 contributions. Oh shucks. SSS should just update their system and provide more channels for the public to reach out to them. Of course many people are troubled with the same issues. Very helpful on my side right now for this kind of topic and thanks for the info. A very helpful post for individuals who have issues with SSS specially on how to withdraw pension. 3 more years pa and I will encounter this stuff. Hope not..
Good thing that you got the adjustment that you asked but does it have to be in a year? It seems so long. The rule of floating the money for 10 days needs to be investigated. Who imposed that, the bank or SSS? And WHY? I know for international wire transfers, banks or 3rd party handlers float the money for several days because it allows them to “borrow/use/potentially earn” from your money on the days they float it. Tsk tsk imagine how many millions are floated every month! You got it, Karen. Your guess is as good as mine. It’s a connivance between the bank and the top people of SSS. If you clicked the link to Part 1, I had figures at the bottom of the post and the amount getting floated is mind-boggling. It runs not only by the millions nor billions, it’s more than PHP5.4 Trillion! I get your adjustment resolved but it’s nice that there is a 5% increase already. No, Franc. It’s not yet resolved. I was wrong in the assumption I stated in my blog. I have an update below the post stating otherwise. Thanks for the visit and the comment. I’m glad I read this. It reminded me to check my SSS records. I studied the SSS law last year and until now, medyo naguguluhan pa rin ako.. Everyone should check your post so he or she can get some ideas about the floating sss pensions.. I didn’t know this is happening. I avail SSS loans and my mother is a pensioner. Checking our SSS records now. 10th it is already there and can be readily withdrawn. If the 10th falls on a Saturday or Sunday, the pension is already credited and can be withdrawn on Friday. I hope this helps you. Hi Nelda, thanks for the visit and the comment. Yes, I can also withdraw my SSS pension on the 8th to 10th of the month. What I am saying in my blogs about this issue of “floating SSS pensions” is that our money is already credited to our accounts on the first banking day and should be withdrawable immediately but we can only withdraw it after a minimum of 7 calendar days (this is the minimum “float”). The float period is the anomaly I am exposing. But the way, the 10th day of the month when your pensioner-father died has nothing to do with the day his pension is available for withdrawal. As I said above, if there is no anomaly being done, you should be able to withdraw your father’s pension right on the first banking day of the month.